Toyota says an updated version of the FCV-R will be shown at the 2013 Tokyo show. LOS ANGELES -- The cost of a completed hydrogen fuel cell vehicle is 1/20th of what it was when current prototypes were being developed, paving the way for a workable business model and improved sales prospects, one of Toyota's top engineers said today. Chris Hostetter, group vice president of strategic planning for Toyota Motor Sales U.S.A., said that prototype fuel cell vehicles cost about $1 million each when they were developed several years ago. But the cost factor for salable vehicles arriving in 2015 will be in the neighborhood of $50,000, he said. That likely should place the sticker price of the vehicle under $100,000, Hostetter said at the Fortune Brainstorm Green conference here. Starting in 2015, Toyota plans to sell a fuel cell vehicle in states covered by the California Air Resources Board mandate. Toyota's current fleet of 100 fuel cell beta-test prototypes is based on the Highlander crossover and carry a real-world range of 440 miles. However, the 2015 production vehicle will have a Prius-like silhouette and size, similar to that of the FCV-R concept hatchback unveiled at the 2011 Tokyo Motor Show, Hostetter said. 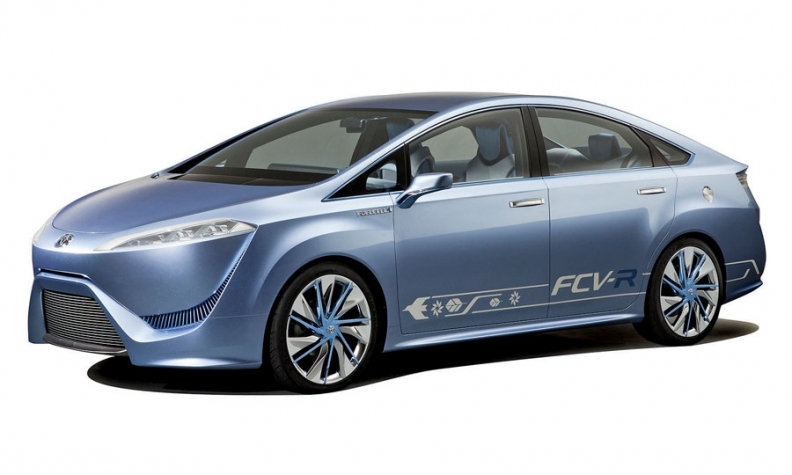 An updated version of the FCV-R will be shown at the 2013 Tokyo show. However, the lack of a workable hydrogen refueling infrastructure could derail the company's sales goals. Toyota fuel cell vehicles may now be sold only in California and New York. California originally planned to have about 60 hydrogen stations statewide, but the target has dropped to fewer than half that number -- and only eight are currently operational, Hostetter said. On the East Coast, New York is the only state that has a feasible hydrogen infrastructure. Selling only in California and New York could still represent a couple thousand units. Hostetter predicts the fuel cell sales rate should equal that of the original Prius, which sold 11,000 units nationwide in 2000, when it went on sale in the U.S. market. The California and New York markets represent a little less than 20 percent of the total U.S. market -- meaning Toyota would be looking to sell about 2,000 fuel cell vehicles in 2015.